Accounting for the astonishing developments in the field of extragalactic astronomy and cosmology, this second edition has been updated and substantially expanded. Starting with the description of our home galaxy, the milky way, this cogently written textbook introduces the reader to the astronomy of galaxies, their structure, active galactic nuclei, evolution and large scale distribution in the universe. After an extensive and thorough introduction to modern observational and theoretical cosmology, the focus turns to the formation of structures and astronomical objects in the early universe. The basics of classical astronomy and stellar astrophysics needed for extragalactic astronomy are provided in the appendix. The new edition incorporates some of the most spectacular results from new observatories like the galaxy evolution explorer, Herschel, alma, wmap and Planck, as well as new instruments and multi-wavelength campaigns which have expanded our understanding of the universe and the objects populating it. This includes new views on the galaxy population in the nearby universe, on elliptical galaxies, as well as a deeper view of the distant universe approaching the dark ages, and an unprecedented view of the distant dusty universe. Schneider also discusses the impressive support for the standard model of the universe, which has been substantially strengthened by recent results, including baryon acoustic oscillations (an approach which has significantly matured over the years), results from the completed wmap mission and from the first Planck results, which have confirmed and greatly improved on these findings, not least by measuring the gravitational lensing effect on the microwave background. Further, a new chapter focusing on galaxy evolution illustrates how well the observations of distant galaxies and their central supermassive black holes can be understood in a general framework of theoretical ideas, models, and numerical simulations. 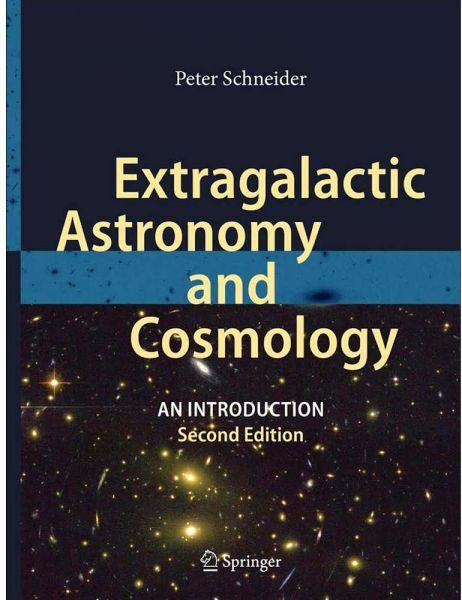 Peter Schneider's extragalactic astronomy and cosmology offers fundamental information on this fascinating subfield of astronomy, while leading readers to the forefront of astronomical research. But it seeks to accomplish this not only with extensive textual information and insights; the author's own passion for exploring the workings of the universe, which can be seen in the text and the many supporting color illustrations, will further inspire the reader. While this book has grown out of introductory university courses on astronomy and astrophysics and includes a set of problems and solutions, it will not only benefit undergraduate students and lecturers; thanks to the comprehensive coverage of the field, even graduate students and researchers specializing in related fields will appreciate it as a valuable reference work.